Looking to try alternative milks because you're curious, lactose-intolerant or vegan? Then perhaps you ought to make your own oat milk! It's SO EASY, economical and delicious. It takes about 20 minutes. Oh, what, does that sound too long? Ever read the labels of the plant milks you're currently drinking? I did; I went through all the boxes of plant milks at Whole Foods and was thoroughly disappointed. They all have sugars, stabilizers, preservatives, emulsifiers and artificial flavors. I personally don't think these things are very healthy to consume on a daily basis. I drink cow milk because it offers me vitamin B12, which is a bacteria found in animal products including eggs. That's why I don't need a B12 supplement. However, I've been reading about the dairy industry lately and feel terrible to be contributing to it weekly. The cows are treated horribly, the calves are separated from their mothers so that we can drink their milk and I don't even want to think about what happens to them after they've produced all the milk they can. It's a grim subject. While I'm not ready to become a full-fledged vegan, I'm cutting down on my dairy consumption. And here's my opportunity with oat milk! It's so exciting, it's kind of a revelation for me. Oats are a serious superfood. They're extremely high in manganese, which helps with bone production, skin function, blood sugar control, and protects against free radicals (Source WHFoods). They're high in a bunch of other minerals and vitamins but particularly biotin, which is great for hair health along with fat and sugar metabolism. More reasons to eat oats on a daily basis is the fact that it is high in protein, regulates blood sugar levels, provides a high amount of fiber and lowers cholesterol. There are endless reasons to consume more oats and they can be found here. I made this oat "mylk" with organic oat groats, which are the whole oat kernels. I soaked them overnight, gave them a good rinse and then blended it up and strained it. Soaking is important because it breaks down nutrient-binding enzymes and makes it more digestible and absorbable in your body. Plus it makes the groats softer so they blend easily in your blender! I just added a pinch of salt to the milk but feel that it could do with some vanilla extract for flavor. The ratio of 1 cup of soaked groats to 3 cups of water produces a very thick milk -- a cream, if you will! So I think adding another cup of water will make it a perfect "whole milk" type product. The flavor can take getting used to if you drink it straight-up but if you use this in your cereal and smoothies, you won't really notice a difference. 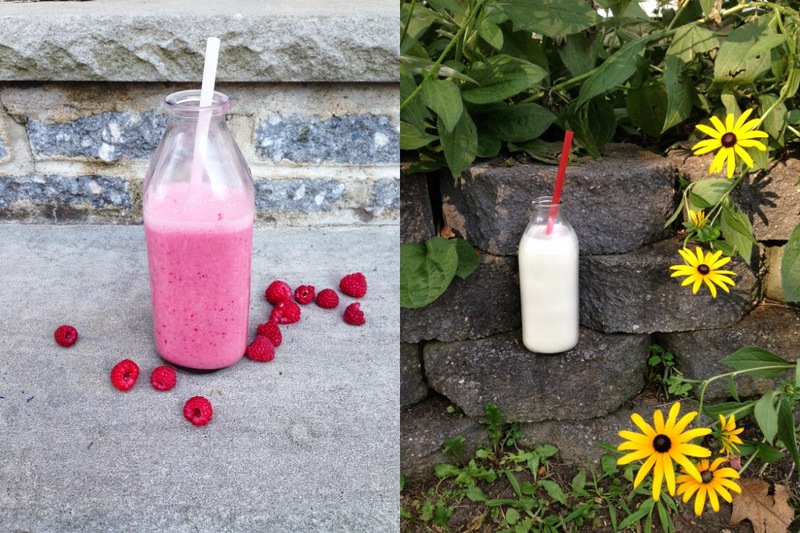 I made raspberry milkshake (pictured above) for my mom from this oat milk and raspberries from the garden and it was beyond delicious, so thick and creamy too! I'm really proud of what I made and am looking forward to sharing it with others. A word about the leftover oat pulp: I hate wasting so I saved the leftovers from my cheesecloth and dried and lightly roasted it on a baking sheet in the oven. Then I pulverized it, turning it into roasted oat flour! It's so yummy in cookies, gives a delicious distinct toasty flavor -- simply replace 1/4 cup of regular flour with this roasted oat flour! The only disadvantage I see from making your own milk is that it isn't fortified with vitamin D, B12 or calcium. These are important nutrients that you need in your diet. If you're vegan, you need a supplement of vitamin B12 and D anyway. As for calcium, much of it can be found in fruits, vegetables, nuts and seeds so it's not so much of a concern. I REALLY hope you try this recipe! Do let me know what you think of it!!!! 1. Rinse your soaked groats really well so that the water runs clear. Drain and pour into your blender. Add 1 cup of water and blend. Once it breaks down the groats, add the rest of the water, salt and vanilla. Blend well again. 2. Place a fine mesh strainer over a bowl (preferably one with a spout for easy pouring). Line the strainer with a clean cheesecloth. Gradually pour the milk through and use a spatula to stir down the mixture. 3. Save the oat fibers by spreading it on a parchment-lined baking sheet. Allow to dry and roast lightly and then pulverize it into oat flour! 4. Pour your fresh milk into a clean bottle with a tight lid. Shake before using. Store in a cool area of your refrigerator. Enjoy within 4-5 days!